Your within-subjects factor is time. Your between-subjects factor consists of conditions (also known as treatments). Imagine that a health researcher wants to help suffers of chronic back pain reduce their pain levels. The researcher wants to find out whether one of two different treatments is more effective at reducing pain levels over time. Therefore, the dependent variable is "back pain", whilst the within-subjects factor is "time" and the between-subjects factor is "conditions". More specifically, the two different treatments, which are known as "conditions", are a "massage programme" (treatment A) and "acupuncture programme" (treatment B). These two treatments reflect the two groups of the "between-subjects" factor. In total, 60 participants take part in the experiment. Of these 60 participants, 30 are randomly assigned to undergo treatment A (the massage programme) and the other 30 receive treatment B (the acupuncture programme). Both treatment programmes last 8 weeks. Over this 8 week period, back pain is measured at three time points, which represents the three groups of the "within-subjects" factor, "time" (i.e., back pain is measured "at the beginning of the programme" [time point #1], "midway through the programme" [time point #2] and "at the end of the programme" [time point #3]). At the end of the experiment, the researcher uses a mixed ANOVA to determine whether any change in back pain (i.e., the dependent variable) is the result of the interaction between the type of treatment (i.e., the massage programme or acupuncture programme; that is, the "conditions", which is the "between-subjects" factor) and "time" (i.e., the within-subjects factor, consisting of three time points). If there is no interaction, follow-up tests can still be performed to determine whether any change in back pain was simply due to one of the factors (i.e., conditions or time). Your between-subjects factor is a characteristic of your sample. Imagine that a researcher wants to determine whether stress levels amongst young, middle-aged and older people change the longer they are unemployed, as well as understanding whether there is an interaction between age group and unemployment length on stress levels. Therefore, the dependent variable is "stress level", whilst the "within-subjects" factor is "time" and the "between-subjects" factor is "age group". In total, 60 participants take part in the experiment, which are divided into three groups with 20 participants in each group, which reflects the between-subjects factor, "age group" (i.e., the 3 groups are "young", "middle-aged" and "older" unemployed people). The dependent variable, "stress level", is subsequently measured over four time points, which reflects the within-subjects factor, "time" (i.e., stress levels are measured "on the first day the participants are unemployed" [time point #1], "after one month of unemployment" [time point #2], "after three months of unemployment" [time point #3] and "after six months of unemployment" [time point #4]). At the end of the experiment, the researcher uses a mixed ANOVA to determine whether any change in stress level (i.e., the dependent variable) is the result of the interaction between age group (i.e., whether participants are "young", "middle-aged" or "older"; the "between-subjects" factor) and "time" (i.e., the length that the groups of people are unemployed; the "within-subjects" factor). If there is no interaction, follow-up tests can still be performed to determine whether any change in stress levels was simply due to one of the factors (i.e., time or age group). Your within-subjects factor consists of conditions (also known as treatments). Imagine that a psychologist wants to determine the effect of exercise intensity on depression, taking into account differences in gender. Therefore, the dependent variable is "depression" (measured using a depression index that results in a depression score on a continuous scale), whilst the "within-subjects" factor consists of "conditions" (i.e., 3 types of "exercise intensity": "high", "medium" and "low") and the "between-subjects" factor is a "characteristic" of your sample (i.e., the between-subjects factor, "gender", which consists of "males" and "females"). More specifically, these three different "conditions" (also known as "treatments") are a "high intensity exercise programme" (treatment A), "medium intensity exercise programme" (treatment B) and "low intensity exercise programme" (treatment C). Each of these three treatments (i.e., treatment A, treatment B and treatment C) reflect the three groups of the "within-subjects" factor, "exercise intensity". In total, 45 participants take part in the experiment. Since "exercise intensity" is the "within-subjects" factor, this means that all 45 participants have to undergo all three treatments: the "high intensity exercise programme" (treatment A), "medium intensity exercise programme" (treatment B) and "low intensity exercise programme" (treatment C). Each treatment lasts 4 weeks. However, the order in which participants receive each treatment differs, with the 45 participants being randomly split into three groups: (a) 15 participants first undergo treatment A (the "high intensity exercise programme"), followed by treatment B (the "medium intensity exercise programme"), and finally treatment C (the "low intensity exercise programme"); (b) another 15 participants start with treatment B, followed by treatment C, and finishing with treatment A; and (c) the final group of 15 participants start with treatment C, followed by treatment A, and finally, treatment B. This is known as counterbalancing and helps to reduce the bias that could result from the order in which the treatments are provided (although you may not have done this in your research). At the end of the experiment, the psychologist uses a mixed ANOVA to determine whether any change in depression (i.e., the dependent variable) is the result of the interaction between exercise intensity (i.e., the "conditions/treatments", which is the within-subjects factor) and gender (i.e., a "characteristic" of the sample, which acts as the between-subjects factor). If there is no interaction, follow-up tests can still be performed to determine whether any change in depression was simply due to one of the factors (i.e., exercise intensity or gender). As mentioned above, the primary purpose of a mixed ANOVA is to understand if there is an interaction between your within-subjects factor and between-subjects factor on the dependent variable. Once you have established whether there is a statistically significant interaction, there are a number of different approaches to following up the result. In particular, it is important to realize that the mixed ANOVA is an omnibus test statistic and cannot tell you which specific groups within each factor were significantly different from each other. For example, if one of your factors (e.g., "time") has three groups (e.g., the three groups are your three time points: "time point 1", "time point 2" and "time point 3"), the mixed ANOVA result cannot tell you whether the values on the dependent variable were different for one group (e.g., "Time point 1") compared with another group (e.g., "Time point 2"). It only tells you that at least two of the three groups were different. Since you may have three, four, five or more groups in your study design, as well as two factors, determining which of these groups differ from each other is important. You can do this using post hoc tests, which we discuss later in this guide. In addition, where statistically significant interactions are found, you need to determine whether there are any "simple main effects", and if there are, what these effects are (again, we discuss this later in our guide). If you are unsure whether a mixed ANOVA is appropriate, you may also want to consider how it differs from a two-way repeated measures ANOVA. Both the mixed ANOVA and two-way repeated measures ANOVA involve two factors, as well as a desire to understand whether there is an interaction between these two factors on the dependent variable. However, the fundamental difference is that a two-way repeated measures ANOVA has two "within-subjects" factors, whereas a mixed ANOVA has only one "within-subjects" factor because the other factor is a "between-subjects" factor. Therefore, in a two-way repeated measures ANOVA, all subjects undergo all conditions (e.g., if the study has two conditions – a control and a treatment – all subjects take part in both the control and the treatment). Therefore, unlike the mixed ANOVA, subjects are not separated into different groups based on some "between-subjects" factor (e.g., a characteristic such as subjects' "gender" or "educational level", or so that they only receive one "condition": either the control or the treatment). Therefore, if you think that the mixed ANOVA is not the test you are looking for, you may want to consider a two-way repeated measures ANOVA. Alternately, if neither of these are appropriate, you can use our Statistical Test Selector, which is part of our enhanced content, to determine which test is appropriate for your study design. In this "quick start" guide, we show you how to carry out a mixed ANOVA with post hoc tests using SPSS Statistics, as well as the steps you will need to go through to interpret the results from this test. However, before we introduce you to this procedure, you need to understand the different assumptions that your data must meet in order for a mixed ANOVA to give you a valid result. We discuss these assumptions next. When you choose to analyse your data using a mixed ANOVA, much of the process involves checking to make sure that the data you want to analyse can actually be analysed using a mixed ANOVA. You need to do this because it is only appropriate to use a mixed ANOVA if your data "passes" seven assumptions that are required for a mixed ANOVA to give you a valid result. In practice, checking for these assumptions requires you to use SPSS Statistics to carry out a few more tests, as well as think a little bit more about your data. Whilst it is not a difficult task, it will take up most of your time when carrying out a mixed ANOVA. Assumption #1: Your dependent variable should be measured at the continuous level (i.e., they are either interval or ratio variables). Examples of continuous variables include revision time (measured in hours), intelligence (measured using IQ score), exam performance (measured from 0 to 100), weight (measured in kg), and so forth. You can learn more about interval and ratio variables in our article: Types of Variable. Assumption #2: Your within-subjects factor (i.e., within-subjects independent variable) should consist of at least two categorical, "related groups" or "matched pairs". 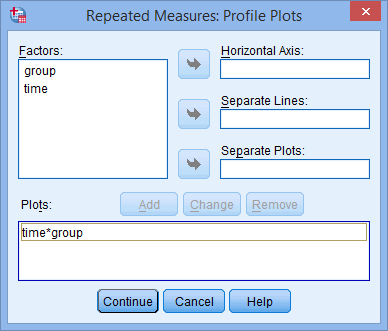 "Related groups" indicates that the same subjects are present in both groups. The reason that it is possible to have the same subjects in each group is because each subject has been measured on two occasions on the same dependent variable, whether this is at two different "time points" or having undergone two different "conditions". For example, you might have measured 10 individuals' performance in a spelling test (the dependent variable) before and after they underwent a new form of computerized teaching method to improve spelling (i.e., two different "time points"). You would like to know if the computer training improved their spelling performance. The first related group consists of the subjects at the beginning of the experiment, prior to the computerized spelling training, and the second related group consists of the same subjects, but now at the end of the computerized training. Assumption #3: Your between-subjects factor (i.e., between-subjects factor independent variable) should each consist of at least two categorical, "independent groups". Example independent variables that meet this criterion include gender (2 groups: male or female), ethnicity (3 groups: Caucasian, African American and Hispanic), physical activity level (4 groups: sedentary, low, moderate and high), profession (5 groups: surgeon, doctor, nurse, dentist, therapist), and so forth. Assumption #4: There should be no significant outliers in any group of your within-subjects factor or between-subjects factor. Outliers are simply single data points within your data that do not follow the usual pattern (e.g., in a study of 100 students' IQ scores, where the mean score was 108 with only a small variation between students, one student had a score of 156, which is very unusual, and may even put her in the top 1% of IQ scores globally). The problem with outliers is that they can have a negative effect on the mixed ANOVA, distorting the differences between the related groups (whether increasing or decreasing the scores on the dependent variable), which reduces the accuracy of your results. Fortunately, when using SPSS Statistics to run a mixed ANOVA on your data, you can easily detect possible outliers. In our enhanced mixed ANOVA guide, we: (a) show you how to detect outliers using SPSS Statistics, whether you check for outliers in your 'actual data' or using 'studentized residuals'; and (b) discuss some of the options you have in order to deal with outliers. Assumption #5: Your dependent variable should be approximately normally distributed for each combination of the groups of your two factors (i.e., your within-subjects factor and between-subjects factor). 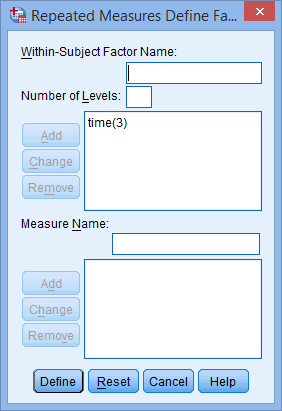 Whilst this sounds a little tricky, it is easily tested for using SPSS Statistics. Also, when we talk about the mixed only requiring approximately normal data, this is because it is quite "robust" to violations of normality, meaning that assumption can be a little violated and still provide valid results. 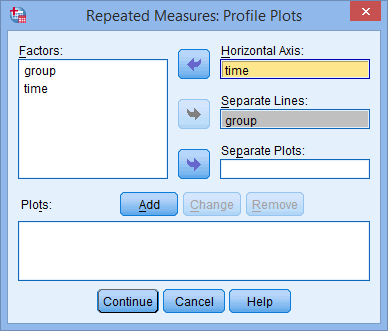 You can test for normality using, for example, the Shapiro-Wilk test of normality (for 'actual data') or Q-Q Plots (for 'studentized residuals'), both of which are simple procedures in SPSS Statistics. In addition to showing you how to do this in our enhanced mixed ANOVA guide, we also explain what you can do if your data fails this assumption (i.e., if it fails it more than a little bit). Assumption #6: There needs to be homogeneity of variances for each combination of the groups of your two factors (i.e., your within-subjects factor and between-subjects factor). Again, whilst this sounds a little tricky, you can easily test this assumption in SPSS Statistics using Levene’s test for homogeneity of variances. In our enhanced mixed ANOVA guide, we (a) show you how to perform Levene’s test for homogeneity of variances in SPSS Statistics, (b) explain some of the things you will need to consider when interpreting your data, and (c) present possible ways to continue with your analysis if your data fails to meet this assumption. Assumption #7: Known as sphericity, the variances of the differences between the related groups of the within-subject factor for all groups of the between-subjects factor (i.e., your within-subjects factor and between-subjects factor) must be equal. Fortunately, SPSS Statistics makes it easy to test whether your data has met or failed this assumption. 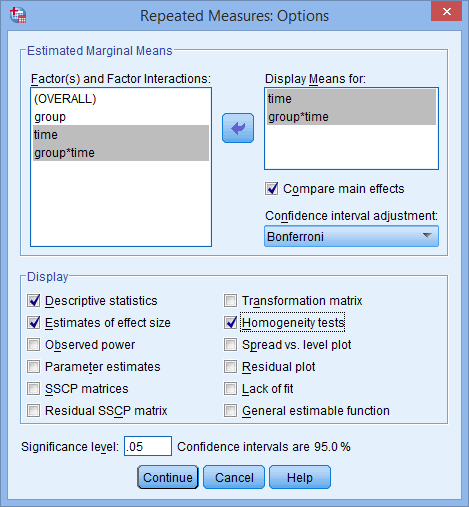 Therefore, in our enhanced mixed ANOVA guide, we (a) show you how to perform Mauchly's Test of Sphericity in SPSS Statistics, (b) explain some of the things you will need to consider when interpreting your data, and (c) present possible ways to continue with your analysis if your data fails to meet this assumption. 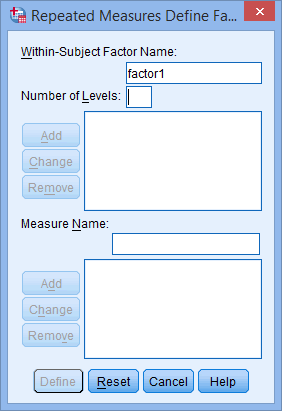 You can check assumptions #4, #5, #6 and #7 using SPSS Statistics. Just remember that if you do not run the statistical tests on these assumptions correctly, the results you get when running a mixed ANOVA might not be valid. This is why we dedicate a number of sections in our enhanced guide to help you get this right. You can find out about our enhanced content as a whole here, or more specifically, learn how we help with testing assumptions here. 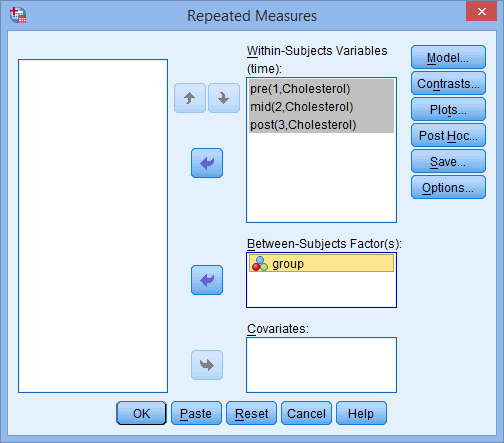 In the section, Procedure, we illustrate the SPSS Statistics procedure that you can use to carry out a mixed ANOVA on your data. First, we introduce the example that is used in this guide. A researcher wanted to discover whether the intensity of an exercise-training programme, but with equal calorific expenditure, had an effect on cholesterol concentration over a six-month period. Therefore, the dependent variable was "cholesterol concentration", the within-subjects factor was "time" and the between-subjects factor was the "conditions" (N.B., each of these variables are explained further below). To answer this, 60 participants were recruited to take part in the experiment, randomly split into three each groups of 20 participants. Each of these three groups of 20 participants received a different "condition": in one group, participants did not change their current sedentary lifestyle (i.e., this was Group #1, also called the "control" group); in another group, participants underwent a low-intensity exercise-training programme that expended 1000 kCal per week (i.e., this was Group #2, also called "treatment A"); the final group underwent a high-intensity exercise-training programme that also expended 1000 kCal per week, but therefore exercised for less total time (i.e., this was Group #3, also called "treatment B"). All of the conditions (i.e., the control, treatment A and treatment B) lasted six months. During this period, the dependent variable, "cholesterol concentration", was measured three times: "at the beginning of the experiment" (time point #1), "mid-way through the six months" (time point #2) and "at the end of the experiment" (time point #3). These three time points (i.e., time point #1, time point #2 and time point #3) represent the three groups of the within-subjects factor, "time". 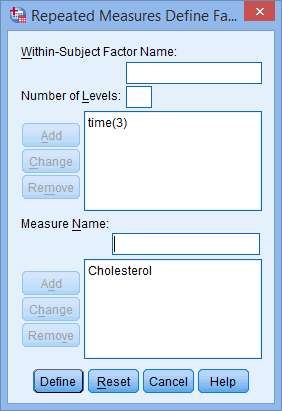 In this example, there are three variables: (1) the dependent variable, cholesterol, which is the cholesterol concentration (in mmol/L); (2) the between-subjects factor, group, which has three categories: "Control" (control group), "Int_1" (treatment A) and "Int_2" (treatment B); and (3) the within-subjects factor, time, which has three categories: "pre", "mid" and "post". Participants' cholesterol concentration was recorded in the variable pre for pre-intervention, mid for mid-way through and post for post-intervention. 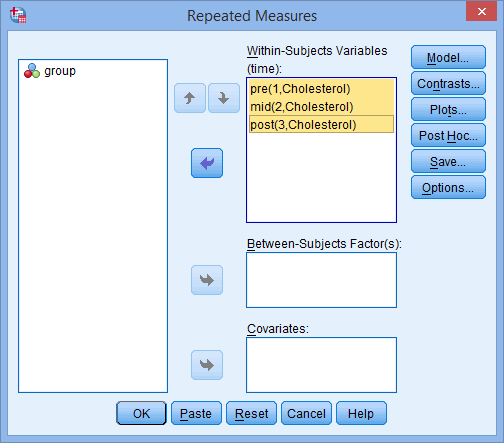 These three variables make up the within-subjects factor, time, and the scores within these three variables reflect the dependent variable, cholesterol. The different interventions were stored in the variable, group, where "Control" is the control group, "Int_1" is the low-intensity training intervention, and "Int_2" is the high-intensity training intervention. In variable terms, the researcher wishes to know if there is an interaction between group and time on cholesterol. 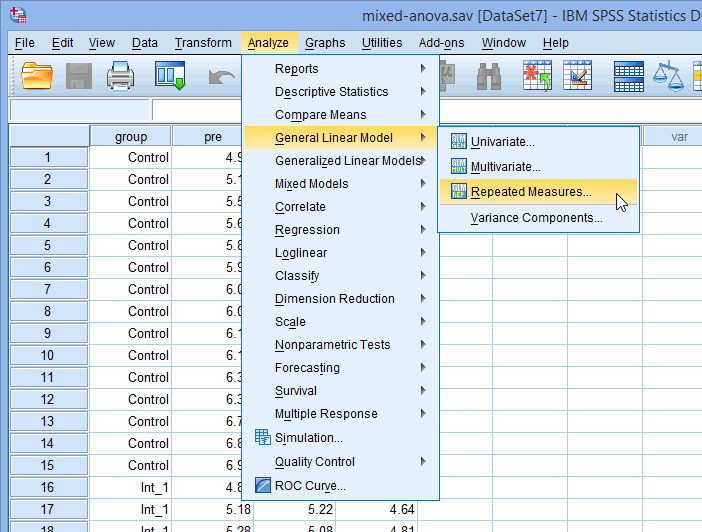 In our enhanced mixed ANOVA guide, we show you how to correctly enter data in SPSS Statistics to run a mixed ANOVA. You can learn about our enhanced data setup content here. Alternately, we have a generic, "quick start" guide to show you how to enter data into SPSS Statistics, available here. The 20 steps below show you how to analyse your data using a mixed ANOVA in SPSS Statistics, including which post hoc test to select to determine where any differences lie, when none of the seven assumptions in the previous section, Assumptions, have been violated. At the end of these 20 steps, we explain what results you will need to interpret from your mixed ANOVA. If you are looking for help to make sure your data meets assumptions #4, #5, #6 and #7, which are required when using a mixed ANOVA and can be tested using SPSS Statistics, we show you how to do this in our enhanced content (see here). Note: This particular setup works well for this example. However, which factor takes the role of the horizontal axis and which the separate lines for your study is up to you (i.e., whatever makes the most sense to you). 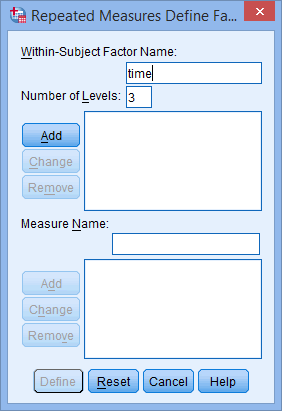 Click the button and you will be returned to the Repeated Measures dialogue box. 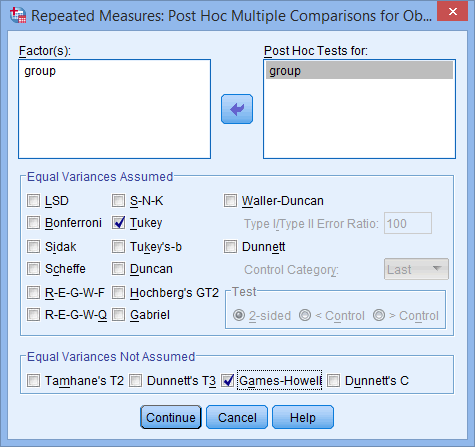 Note: If your between-subjects factor only has two groups, you will not need to run any post hoc tests. Remember, these post hoc tests are for the main effects and not the interaction (i.e., they are not simple main effects). Click the button. This will generate the output. Step #1: You need to interpret the results from your assumption tests to make sure that you can use a mixed ANOVA to analyse your data. This includes analysing: (a) your actual data or studentized residuals to check that there were no significant outliers in any group of your within-subjects factor or between-subjects factor (Assumption #4); (b) your actual data or studentized residuals to determine that your dependent variable was approximately normally distributed for each combination of the groups of your two factors (Assumption #5); (c) the variances for each combination of groups of your two factors to check for homogeneity of variances (Assumption #6); and (d) the variances of the differences between all combinations of groups of your within-subjects factor to check for sphericity (Assumption #7). 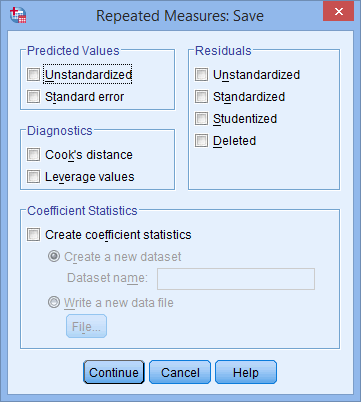 This SPSS Statistics output will not only determine whether you have to go back to the beginning of the whole mixed ANOVA process in order to try and make adjustments to your data so that you can use this test (e.g., by "transforming" your data), but also what SPSS Statistics output you need to interpret later (i.e., based on the results from the Mauchly's tests of sphericity, which is used to test assumption #7). Step #2: You need to make an initial judgement of what your data looks like and whether you might expect a statistically significant interaction term. You can do this by interpreting your profile plot. Once you have done this, you can look at the formal statistical test in the Tests of Within-Subjects Effects SPSS Statistics output to determine whether you do indeed have a statistically significant interaction term. Which part of this output you should interpret will depend on whether your data passed the assumptions tests in Step #1 above. Step #3a: If you have a statistically significant interaction, reporting the main effects within the Tests of Within-Subjects Effects SPSS Statistics output can be misleading. Instead, you need to determine the difference between your groups at each level of each factor. You do this by analysing your data again to determine what are known as simple main effects (i.e., rather than main effects). Since you have already gone through the 20 steps in SPSS Statistics above, this is a very quick procedure in SPSS Statistics. However, you need to do this for both factors. For example, using the back pain example at the beginning of this guide, you would first be interested in testing the simple main effects of your "between-subjects" factor, the "conditions" (i.e., this factor as two groups: the "massage programme" and the "acupuncture programme"). This would involves testing for differences in back pain scores (i.e., your dependent variable) between the two conditions at each group of the "within-subjects" factor, "time" (i.e., you are testing for differences between the two conditions at each of the three time points: "at the beginning of the programme", "midway through the programme" and "at the end of the programme"). You then need to this all over again, but this time, focusing on the simple main effects of your within-subjects factor, "time". After carrying out these simple main effects procedures in SPSS Statistics, you need to interpret the profile plots that are produced, as well as the new SPSS Statistics output in the Mauchly's Test of Sphericity, Tests of Within-Subjects Effects and Pairwise Comparisons tables. You are now in a position to write up all of your results. 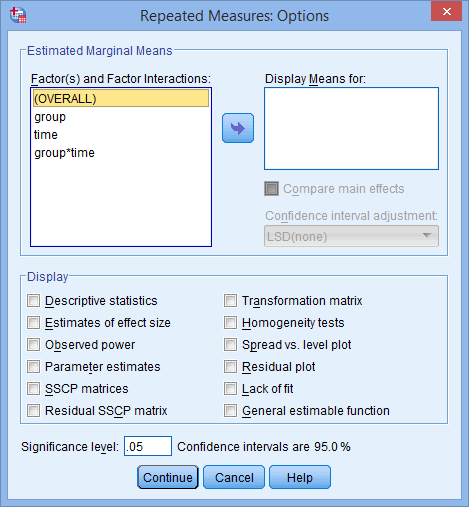 Step #3b: If you do not have a statistically significant interaction, you need to interpret and report the main effects within the Tests of Within-Subjects Effects SPSS Statistics output tables (i.e., rather than calculating simple main effects, which you do when the interaction is statistically significant). You have to interpret the main effects for both factors (i.e., the "within-subjects" factor and "between-subjects" factor). 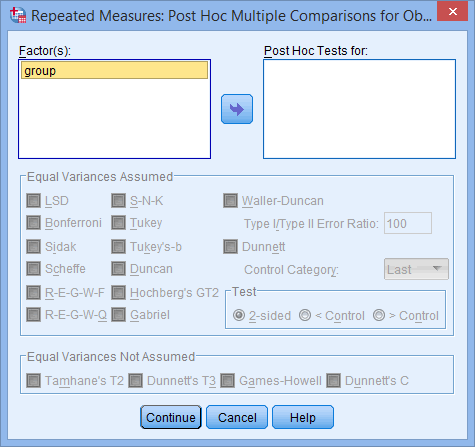 In addition, if either of these main effects is statistically significant, you will need to interpret the relevant SPSS Statistics output from your post hoc tests in the Pairwise Comparisons table. This will help you to understand where the differences between the groups within your factors lie (e.g., from our back pain example, the differences in back pain between the two "conditions": the "massage programme" and the "acupuncture programme"). 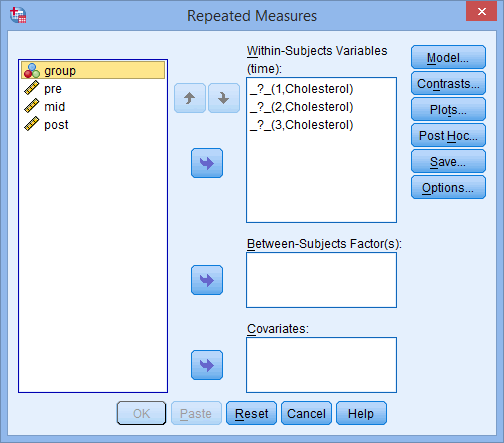 If you are unsure how to interpret your mixed ANOVA results or how to check for the assumptions of the mixed ANOVA, carry out transformations using SPSS Statistics, or conduct additional SPSS Statistics procedures to run simple main effects on your data (see Step #3a), we show you how to do this in our enhanced mixed ANOVA guide. We also show you how to write up the results from your assumptions tests and mixed ANOVA output if you need to report this in a dissertation/thesis, assignment or research report. We do this using the Harvard and APA styles. You can learn more about our enhanced content here.